Your website only gets one chance to make a first impression . . .
Be the only web page with stars in the Google results. 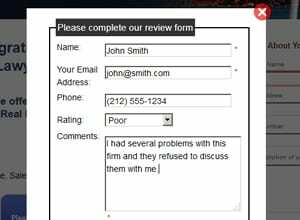 Our Testimonial Generator makes it easy for your website visitors to leave you a review. You will be automatically notified whenever you get a new review. Users without Google accounts are assisted in making an account, or in leaving you a testimonial instead of a Google review. Get on the Google Map! Have You Ever Wondered Why Your Competitor Shows Up on the Google Map and You Don't? As noted above, more Google Reviews means better placement on the Google Map. However, if your Google My Business (GMB) listing is not properly set up, it is virtually impossible to appear on the Google Map. Use our Listing Setup service to properly establish your Google My Business listing and maximize your chances of appearing on the map. As noted above, more Google Reviews means better placement on the Google Map. However, if your listing is not properly set up, it is virtually impossible to appear on the Google Map. Leverage your good reviews. Start your free trial today.